The digital marketing is ever changing, and the future scope of digital marketing industry is determined by the developments and ideas that call for unified interworking of different mediums. Marketers are constantly looking into the future and trying to predict the next big trend to stay updated and in the league. From smartphones to wearable gadgets and tablets, the evolution of mobile devices is one of the prime factors that influence the world of marketing. As the focus is fast shifting to smaller screens, the brands need to strike a personalized relationship with the customers by leveraging the power of mobile. The successful marketing is the result of collecting, analyzing, and using the data about where and when the consumers spend their time. Learning from the behavior drives strategic campaigns and creative messaging. All the difference in the digital space is made because of the emotional connection through messaging, design, social media, and advertisements. The traditional funnel system has numerous problems, first and foremost being there are too many steps, which also means too many opportunities to lose the prospective buyers. Therefore, marketers have realized that in today’s time it is not about the funnel, it is about marketing ecosystem, as no two customers will take the same journey to conversion. There are numerous ways for the buyer to engage with the brand, engage in product research and make the decision. Today the consumer journey is too complex and ever evolving. Thus, it is essential to have a single view of the buyer interactions both online and offline. It gives brands the customer intelligence it needs to create impactful cross-channel campaigns. For continuous and consistent experience, a holistic approach is essential for conversions. With the changing trends, advertising technology can be narrowed on specific variables like product type, keywords, demographics, and interest. The critical aspect of any marketing strategy is targeting the right audience effectively and efficiently. To make a campaign successful businesses need to find creative elements within their advertisements that perform well for each online ‘buying scenario.’ Social media websites such as Facebook has some specific variables for ads. You can narrow down by age, location, interest, political views, behaviors, and more. It helps you find what works for your audience and work efficiently. It is imperative to have an honest feedback on your messages and campaigns from your audience. By incorporating the interpretation of your fans and opinions about your brand, you can generate fresh content. Invite your customers to create testimonials, videos, or send images and reward them well for participation and brand loyalty. One way is to give them the spotlight in the campaign. It is important to have a holistic strategy, and each social media page must have a purpose. Never post just because for the sake of it, ensure that the posts are made keeping your target audience in mind. It will not be wrong to say that transparency will dictate the brand-customer relationships. It is important to create real brand value to survive in the competitive market. The future of the digital marketing is rooted in how the marketers create ways for traditional and new media to play together. The need for good content will never slow down. Though, visual content will rule the digital marketing world. Highly appreciate this blog for shedding a light on the latest trends as well as future perspective of Digital Marketing. I must say, this informative write-up is of superior quality. Would like to read many such blogs in future. Digital marketing is undoubtedly an ever-changing and ever-developing one. And this particular article talks about all the nitty-gritties of this particular field. I am bookmarking this blog for more such interesting articles in the future. Really learned a lot through this article. Thanks for sharing! It’s a good thing that you wrote this blog. People really need to know what digital marketing is all about these days. I am sure most of the people do half-baked work. Everyone is aware about Digital marketing. 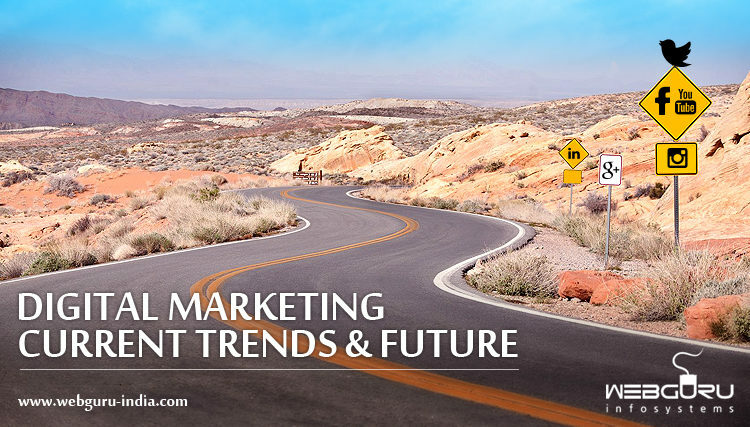 Future is very bright in Digital Marketing. So many website companies whether it is software development company, or ecommerce platform or small business every one wants Goodwill in market. It will grow your business. I appreciate your thought. Now Digital Marketing trending and for our business we should apply the all techniques even our business is small or big, no matter. Every one should be aware about this. Thanks for sharing your information. The digital marketing is ever changing, and the future scope of digital marketing industry is determined by the developments and ideas that call for unified interworking of different mediums.